David and Lizzie set up ‘Ottley’s’ soon after they met in January 2005. David already had 150 laying chickens but the breeding of the Gloucester Old Spots was their joint venture. David is currently the Stockman at the local Agricultural college and has worked in a farm environment since he was sixteen. He has been the Manager of an organic chicken flock, a herdsman at a pig farm and has kept his own chickens and sheep as a hobby. He has a wealth of experience and has attended numerous training courses. David also has an NVQ level 3 in poultry management. Lizzie is currently employed as the Manager of a junior farm at a near-by theme park. Previously she worked for several years at the same agricultural college as David as an animal care technician. Lizzie has an HND in animal science and both Lizzie and David have certificates in the ‘safe use of veterinary medicines’. So Why Blue Welly Farm? David and lizzie got married in July 2006 in their local church. It was a true country-style wedding. 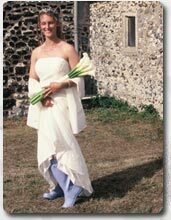 Lizzie travelled to the church in a trailer pulled by an old massy Ferguson, and under her wedding dress, she had on her blue wellies. Hence Blue Welly Farm. Click here to see Blue Welly Farm on Countryfile!